Vertu is a luxury phone maker that is well-known as a status symbol amongst the newly rich crowd in the Persian Gulf, Russia or China, but you can also find its boutique shops in Paris or Beverly Hills. It is owned by Nokia, but takes every precaution not to be associated with the world's largest cell phone maker by volume, which we don't blame it about, especially after the last financial quarter. Never to be on the bleeding, or even the mid-range edge hardwarewise, Vertu compensates with handcrafted design and exclusive services. Its boss Peter Oosting says the company has increased staff by 50% because it experienced "high double-digit sales growth" since 2010, and sells about 30 000 phones a year. The average price is $5800 apiece, but the pimped out models in the Signature line go up to $17 000. For this kind of money you are getting... customized Symbian, with exclusive city guide apps for example, and a free concierge service for the first year you can call any time day or night to assist with both the mundane and the crazy requests. 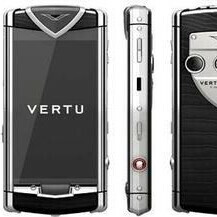 Now for the first time since its inception in 1998, Vertu comes up with a touchscreen device, the Constellation T, as revealed by a Bluetooth filing. The luxury handset sports a 3.5" AMOLED display, 32GB of internal memory and an 8MP camera with dual-LED flash, which, compared to the rest of Vertu's lineup, is high-end. No word on pricing, but considering there won't be a keypad to adorn with diamonds, it might be cheaper than the Signature line. We kid, but Vertu is mum on pricing yet, and the Constellation T is expected to hit next month. all that money and customers are barely getting their first touch screen?